Really couldn't squeeze that power brick in there, huh? With the Xbox One launching eight years after the Xbox 360 you would expect that the engineering team that created the new next-gen console had plenty of time to tweak the final product to perfection. And that's exactly what lead designer on the Xbox One, Carl Ledbetter claims to have done. In a feature about the designer on the Microsoft website Ledbetter explains that the design team worked through more than 75 console, 100 Kinect and 200 controller prototypes in the search to create the best next-gen games machine. Previously we'd heard "a large number" of prototypes had been created, but this is the first time we've heard that number surpasses 75. 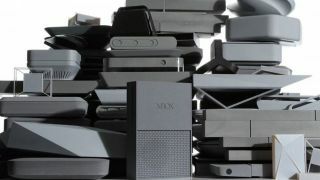 That sure is a lot of prototypes, but we can't help but wonder how the final version ended up with that external power brick that's bigger than the Kinect camera and a pain to factor into the setup. Interestingly, Ledbetter's passion for the final product is best exemplified by the minor details, like the fact the Xbox logo on the console and controller both dim in a dark room and lighten in a bright room. "We wanted to take every component of what people love about Xbox and amplify it, but also make it disappear into the living room - to stay in the background, robust and reliable," he is quoted as saying. The final product seems to have done the job, with Xbox One outselling the PS4 in the United States in December. It would probably make sense for you to read our Xbox One review now, right?